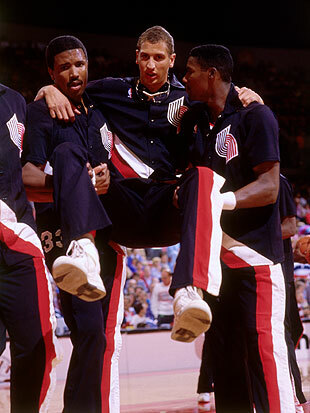 The sad tale of Sam Bowie has been told and re-told many times in the 28 years since the Portland Trail Blazers selected him second overall in the 1984 NBA draft, but for the first time in quite a while we've actually been given a new wrinkle to his story. Bowie, who constantly battled foot and leg problems throughout his star-crossed (but not star-making) career, played in only 511 out of a possible 820 games in his 10-year run. He never made an All-Star team, and never was given the chance to follow through on the potential that his long frame, smooth touch, smart instincts and good athleticism created for him. Now, some 17 years after his last NBA game, Bowie revealed in an ESPN documentary that his NBA career began with the center needlessly keeping quiet about how much pain he was in during the days leading up to Portland's selection of the former Kentucky center. A selection that, famously, came one spot before the Chicago Bulls took Michael Jordan with the third overall pick. "I can still remember them taking a little mallet, and when they would hit me on my left tibia, and 'I don't feel anything' I would tell 'em. But deep down inside, it was hurting. If what I did was lying and what I did was wrong, at the end of the day, when you have loved ones that have some needs, I did what any of us would have done." ESPN graciously allowed us a sneak peak at the docu, and though we haven't had time to work through the whole thing, a few significant factors pop up. For one, Bowie's time in high school in Lebanon, Pa., may have been a peak as a healthy performer, but in watching the big man it's clear even then that he was uneasy at times while dealing with aches and pains, or needed to be taught and trained to work through the game in a way that didn't put undue stress on his legs and feet. Watching video of Bowie from that era is to see all the hallmarks of Sam at his best — all alley-oop dunks and slick passing — but it's uncomfortable at times to watch him work up and down the court. There's a fractured shin in college that went undiagnosed for months. Then there's the admission that he hid pain from Portland doctors before the draft. And then on draft night, with Houston already having selected Hakeem Olajuwon first overall and Jordan off at Team USA's training camp in preparation for the 1984 Olympics, the Blazers made what was considered the obvious choice. With an All-Star small forward in Jim Paxson already on the roster, and a promising young shooting guard in Clyde Drexler set to take in a minutes increase at shooting guard, they chose Bowie. And Bowie, speaking in 2012, relayed that even while sitting amongst his draft class on that night, he knew that something was wrong. That, "deep down inside I physically wasn't what these guys were." His rookie season went swimmingly. 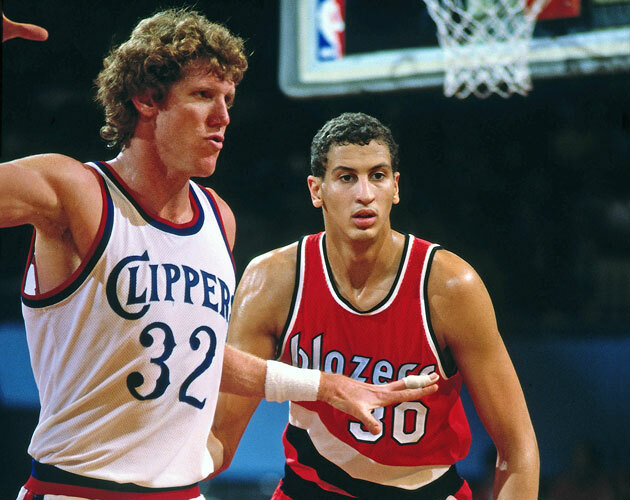 Not to the tune of Jordan's 28.2 points per game and Rookie of the Year award, but as part of a more talented Portland collective featuring Drexler, Paxson, Kiki Vandeweghe and Mychal Thompson that shared the ball and won 42 games despite a very young roster. On top of that, Portland ranked seventh in offense and eighth in defensive efficiency that season, and probably should have won more games. The team's Expected Won/Loss Record of 49-33 details as much. And yet Bowie was in pain, though he pointed out in the documentary that he "never told any of the Portland Trail Blazer personnel that it ever bothered me." By this time, nobody was claiming that Bowie was a better player than Jordan — but especially in that era, taking an All-Star level big man over an All-NBA guard was always the way to go. And, in the cruelest of ironies, it should be reminded that Jordan went out with what was nearly a season and career-ending broken foot just one week into his second campaign. Weeks before Bowie's troubles set in. When the troubles did set in, they set in to frightening amounts. A broken left leg in his second season, a rare NBA injury, and a broken right leg in his third season — with the second coming on a relatively innocuous play. Bowie revealed in the documentary that he suffered a hairline fracture in his right tibia during his fourth season just while walking around in a pregame shootaround of a preseason game. The years between the spring of 1985 and February of 1989 were lost, and the NBA was a different league by the time Bowie returned. Somewhat triumphantly, after a trade to New Jersey, Bowie worked as a serviceable center with the Nets from 1989 until 1993, showcasing those all-around skills but also playing with the sort of hesitancy that only three broken legs could create, while dealing with turnover mistakes that most players worked through in their early and mid-20s. Bowie didn't really get to have those early to mid-20s, though. By the time he was dealt to the Lakers in 1993, Jordan had won three championships and retired. By the time Sam retired two years later, Jordan had returned and was on his way to three more. The new news and upcoming documentary should shift the narrative, if only for a while. The ancient "Bowie over Jordan?" tale has been batted around for too long. Before Jordan, guards alone did not win titles — even Jerry West and Oscar Robertson needed All-NBA centers to join their sides before they could win a title, and the makeup of the NBA for decades rested as a result of that orthodoxy. Portland's Jim Paxson was a 26-year-old two-time All-Star who had averaged over 21 points per game for the two seasons prior to Bowie's arrival. Everyone knew, even after a season that saw him average just 7.7 points per game as rookie, that Clyde Drexler was going to turn into "Clyde Drexler." Nobody knew that Michael Jordan was going to become "Michael Jordan." This discussion needs to be shelved. What needs to be discussed is transparency. With the advent of rookie scale contracts, no player should be sloughing off injury issues just to angle for a place in the draft. Nor should they as a professional, with a team full of physicians already there to help. Whether it's potentially the tragic time bomb of a head injury or an initially manageable pain that leads eventually to a career-ending series of stress fractures, everything needs to be discussed. And, as we've seen with the Golden State Warriors as they deliberately misled their fans with Andrew Bogut's injury, or curious times in Chicago or Washington and even with the Los Angeles Lakers as these teams act mousey and dubiously positive in the wake of injury news, that news needs to get out. The real news. Not the news that teams think the Plebs that fill their stands need to hear. It can prevent heartache, and it can prevent a career gone sour. All you have to do is respond honestly to the weight of that mallet.